We were delighted to have been sent this photo by Francis and Gabrielle Mason, following their wedding in August of 2014. The photo shows the newly named Mrs Mason receiving a gift which was given to her, by her sister-in-law at the wedding. The present was brought following a chance visit to Allerford Forge when Mrs Mason’s sister-in-law was walking in Allerford. When she saw the personalised wedding gift offered by West Country Blacksmiths in a photo at the forge, she new she had stumbled upon the perfect gift. 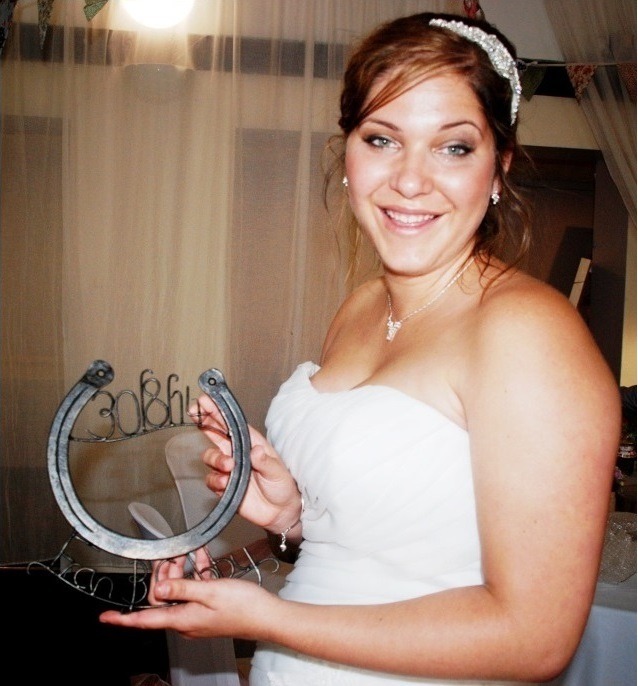 We feel that the horseshoe wedding gifts are perfect as they look fantastic, are very personal and will last forever, to help any new couple remember their special day. The idea came about after working with a couple who were looking for a gift and wanted to incorporate a horseshoes, as horseshoes have been known to be a part of weddings in England for for centuries. It was thought that a blacksmith’s horseshoe at a wedding would bring luck to the marriage of the happy couple. From this discussion the team developed this idea and we are pleased to offer to make more. If you have an upcoming wedding and would like to know more, please click this link - http://westcountryblacksmiths.co.uk/product/personalised-wedding-gifts to be redirected. On behalf of West Country Blacksmiths, we wish Mr & Mrs Mason long term happiness together.